This new, thoroughly updated second edition of Bradt's North York Moors and Yorkshire Wolds, part of the distinctive 'Slow travel' series of guides to UK regions, remains the only full-blown standalone guide available to this region of contrasts, from the magnificent cliffs and beaches of the Heritage Coast and rolling hills of the North York Moors to the tranquil chalk downland of the Wolds. Nestled at the heart of it all is the ancient historic city of York, with its stunning Minster, the largest Gothic cathedral in Northern Europe. 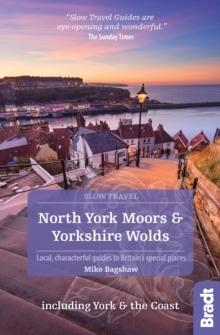 As well as featuring all the main sights, Bradt's North York Moors and Yorkshire Wolds includes places and aspects of the region not detailed by other guidebooks and, while making a virtue of being selective, nonetheless covers the whole region in considerable detail. 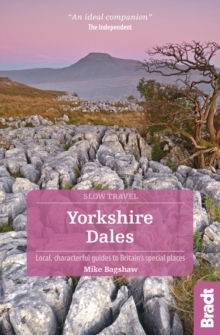 It also includes personal anecdotes and the views of local people as well as tapping into the Yorkshire-based author's considerable knowledge of the region, especially his experiences as an outdoor enthusiast, naturalist and beer connoisseur. With Bradt's North York Moors and Yorkshire Wolds, discover what makes this area tick. The annual Tour de Yorkshire has helped to establish the region as a biking Mecca, while the Yorkshire Nature Triangle in the east is renowned for its birds and wildlife, from adders to barn owls, otters to dolphins. Wildlife lovers will also find details of whale-watching tours. Included in the guide is information on the 10 long-distance paths which cross the area, plus tips on the sandy beaches and rocky coves that make this an ideal family destination. Local food and drink, from seafood to meats, cheeses and breweries, is covered, too. Also included are details of festivals, steam train journeys as featured in the Harry Potter films, the Georgian opulence of Castle Howard as featured in Brideshead Revisited, sea-bird colonies along the Heritage Coast, the only mainland colony of gannets in England at Bempton Cliffs, and the tallest standing stone in Britain. 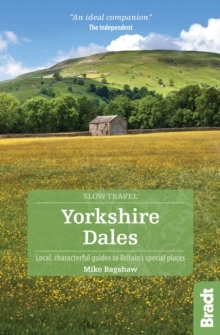 Written in an entertaining style combining personal narrative with authoritative information, Bradt's North York Moors and Yorkshire Wolds has all the most up-to-date information you could need for a successful visit.